Northern Breezes Sailing School has expanded its youth program to include keelboat sessions located in French park, on Medicine Lake. This is a unique opportunity for older students to sail larger boats in our youth camp. Sessions are full days from 9am - 4pm and half days from 9am - 12pm or 1 - 4pm. Previous campers can attend this camp before turning 14 upon review of their sailing skills. Students will have the opportunity to crew and skipper one of our 20' keelboats. This is a great course for those who have been in the youth camp for a while and also for those who are new to sailing. Skills and knowledge will be built upon throughout the week to continually challenge students and their abilities. Instruction will range from basic sail trim and steering to flying a spinnaker while sailing downwind. Sailing games, fun competitions and other on-the-water activities will make sure that students have a good time while learning the fundamentals of sailing. The main goal of the program is to have fun while learning how to sail. At the end of the course, students will have completed all of the necessary requirements to receive their ASA Basic Keelboat certificate. This will allow students to take additional courses through Northern Breezes or other ASA certified schools. Ages 14 and older may add certification in Basic Keelboat (ASA 101) for an additional $95. 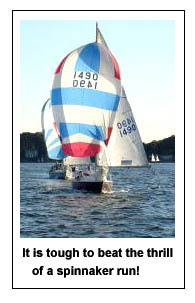 Students are encouraged to sign up for more than one session as the additional practice will make them better sailors. A discount will be given to multiple week students: $15 off 1/2 Day sessions or $25 off Full Day sessions. Special dates and times are possible. Please call the office for more information. We are able to make special arrangements for groups of 3 or more. For more information: Call 763-542-9707; email inquiry below.